"The best you've ridden is the best you know!" These kits offer the advantage of custom valving on both Mid-Valves as well as Rebound Valving stacks. Available for most forks. The Race Tech Spring Conversion System (SCS) transforms your Showa TAC forks found on recent model Kawasaki KX450, Suzuki RMZ450, and Honda CRF250 from an air spring to a coil spring setup. NOW AVAILABLE - Spring Conversion for WP AER 48. Many riders prefer the feel and reliability of a coil spring over an air spring. The Race Tech SCS is a set it and forget it solution. These kits are designed to transform your air forks into an SFF style coil spring fork. Be sure to select the proper rate RT Hi-Performance Spring (sold separately) to compliment your RT Spring Conversion System. Installation is so easy you'll be ready to hit the track within minutes with this "drop-in." No need to check pressures before each ride any longer. Springs - Sold separately. In general 48mm forks require FRSP 4466 Series Springs. 49mm forks require FRSP 4566 Series Springs. The stock 16mm shock shafts found on most modern stock shocks are at risk of bending under the extreme circumstances of modern Supercross, Arenacross and Freestyle competition. Thus the Race Tech Pro Series 19mm Shock Shaft Kit was born, and ultra-durable shock shaft to withstand the rigors of Supercross and Freestyle. The RT Shaft Kit is 40% stronger than stock shafts! The RT Pro Series Shock Shaft Kits also include a built in Rebound Separator, and a spring top out (instead of the stock hydraulic setup for KYB units). This provides a more free initial movement for less harshness. These 17-4 Stainless Steel Compression Posts replace the stock aluminum units. The stock units are at risk of bending with the extremely agressive setups required for modern Supercross, Arenacross, and Freestyle competition. These units are FOUR TIMES STRONGER than the stock posts and are a must for Supercross, Arenacross, and Freestyle Motocross. See Reservoir Rod Compression Posts in the Twin-Chamber section of the Product Search FPTC CR Series. Dual-Chamber Pressure Springs are there to prevent cavitation. 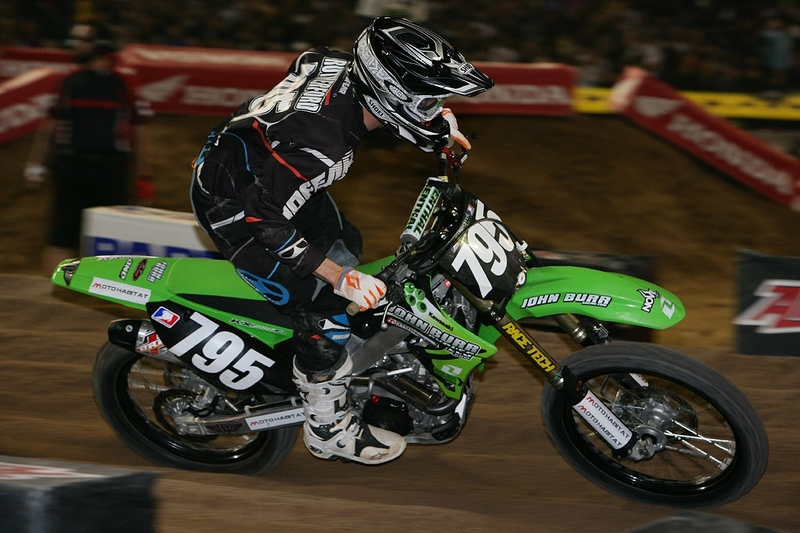 Pressure spring-rates need to match stiffer valving used for Supercross and outdoor motocross conditions. Proper rate Pressure Springs provide a consistent feel and smoother cornering. RT Pressure Springs fit both Showa and KYB. RT Billet Dual-Chamber Fork Reservoir Pistons replace stock plastic pistons which have a tendency for failure. Add increased bottoming resistance and damping control on the second half of the stroke. Now available from Race Tech are Bottoming Separators for Showa TAC forks, Showa SFF Spring Forks, and Show Triple-Air Forks. Race Tech has two variations, one for Motocross and one for Supercross to control damping and prevent from blowing through the stroke. These bottoming separators are reversable to provide two positions of engagement with 20mm of difference. Simply bolt Race Tech Fork Tanks on for a significant improvement on square edge bumps for MX and Enduro without sacrificing bottoming resistance. Fully adjustable, for every terrain, the Air Control System allows the effective oil level to automatically adjust for big hits, braking bumps and G-outs. Great for motocross and off-road. You will be impressed! Kit comes with mounting brackets and adapters. We can rebuild and revalve Works Performance shocks. We have many parts like Shaft Seals and Bladder Upgrades (shown). Call us. For 2014, Honda took an already tried and true CRF250 and gave it an all new update. 2014 brought a new frame design along with updated 48mm Showa Forks and Showa shock along with a new linkage ratio. In stock form, the Honda CRF250's suspension is a bit soft for the average rider and the bike tends to lean a bit more towards the front than wanted, providing a "stink bug" feel. With proper spring rates and Race Tech Gold Valves, the 2014 Honda CRF250R will stiffen up the suspension all around and provide a better-balanced ride along with increased bottoming resistance and plushness over breaking bumps and square edged chop. We guarantee it! Multiple test riders have stated that Honda's 2014 CRF250R is a bit on the soft side in stock form, so we suggest Race Tech Hi-Performance Springs. The main advantage of Hi-Performance Springs is that they have a high stiffness-to-mass ratio. In other words; our springs are light weight for their particular spring rate. This requires the finest materials and processing. We hold the highest tolerances in the industry. These are the best springs you can buy! RT Hi-Performance Springs with the proper rates are a must for both front and rear. Find your recommended spring rate. Race Tech’s Gold Valve Fork Kits break through the limitations of stock piston designs to provide great traction, a plush feel, and drastically improved bottoming resistance. Each Gold Valve kit includes a personalized setup tailored to the individual rider 100% guaranteed to improve comfort, control, and handling. For further tuneability, improved control and traction, Race Tech offers Fork Rebound Gold Valve Fork Kits. This valve kit increase flow area, putting valving control on the shim stack instead of the piston. Race Tech’s G3-LD Shock Gold Valve Kit allows your Honda CRF250R to absorb the toughest of landings and smooth out the biggest of breaking bumps while remaining plush and providing traction over small chatter. For further increases in traction and better bottoming resistance, Race Tech offers a Rebound Separator Valve. This valve replaces the Shock Shaft Nut with an asymmetric valve that flows through the Low-Speed Rebound Adjuster. 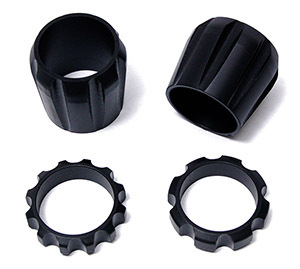 This means Low-Speed Rebound Damping can be set for excellent traction while keeping the compression nice and firm. Honda's CRF450R has remained one of the most popular full size bikes since its introduction. In 2014, Honda stayed with a relatively unchanged, but excellent, 2013 chassis. This model comes with 48mm KYB air forks and 50mm KYB Shock instead of the traditional Showa suspension of previous years. Through testing and development, we've found that the CRF450R benefits from damping and spring rate changes. The correct spring rate, specified for the rider’s weight, and customized valving tuned for application and skill level is required for a proper setup on the CRF450R. Correct spring rates and Race Tech Gold Valves will increase bottoming resistance and plushness over braking bumps, as well as square edged chop. We guarantee it! The main advantage of Hi-Performance Springs is that they have a high stiffness-to-mass ratio. In other words; our springs are light weight for their particular spring rate. This requires the finest materials and processing. Also we hold the highest tolerances in the industry. These are the best springs you can buy! Find your recommended spring rate. To improve traction, provide a plush feel, and drastically improve bottoming resistance, we recommend a Race Tech Gold Valve Fork Kit. Each Gold Valve kit includes a personalized setup tailored to the individual rider 100% guaranteed to improve comfort, control, and handling. Race Tech also offers Fork Rebound Gold Valve Fork Kits for further tuneability and improved control and traction. This valve kit increase flow area, putting valving control on the shim stack instead of the piston. For added performance on your Honda CRF450R's shock, we recommend installing Race Tech’s G3-LD Shock Gold Valve Kit. This Gold Valve Kit allows the shock to absorb the toughest of landings and smooth out the biggest of breaking bumps while remaining plush and providing traction over small chatter. Race Tech also offers a Rebound Separator Valve for increased rear-end traction and better bottoming resistance. This valve replaces the Shock Shaft Nut with an asymmetric valve that flows through the Low-Speed Rebound Adjuster. This means Low-Speed Rebound Damping can be set for excellent traction while keeping the compression nice and firm. Since 2011, the KX250F has stayed relatively unchanged except for an addition of Showa SFF forks in 2012. Most test riders of the 2014 KX250F complain of a very stiff front end and softer shock setting than normal, making for a very unpredictable ride. The good news for consumers is that Race Tech Gold Valves will give KX250F owners an advantage, providing riders with a plush feel and that extra traction that the stock suspension lacks, while not compromising bottoming resistance. The correct spring rate, specified for the rider’s weight, and customized valving tuned for application and skill level is required for a proper setup on the KX250F. Correct spring rates and Race Tech Gold Valves will increase bottoming resistance and plushness over braking bumps, as well as square edged chop. We guarantee it! Kawasaki's KX250F has a very stiff front end for the average rider, so we suggest Race Tech Hi-Performance Springs. The main advantage of Hi-Performance Springs is that they have a high stiffness-to-mass ratio. In other words; our springs are light weight for their particular spring rate. This requires the finest materials and processing. We hold the highest tolerances in the industry. These are the best springs you can buy! Find your recommended spring rate. Race Tech’s G3-LD Shock Gold Valve Kit allows your KX250F to absorb the toughest of landings and smooth out the biggest of breaking bumps while remaining plush and providing traction over small chatter. For 2014, the KX450F has remained relatively unchanged from the 2013 model. Race Tech Gold Valves will give KX450F owners an advantage, providing riders with a plush feel and that extra traction that the stock suspension lacks, while not compromising bottoming resistance. The correct spring rate, specified for the rider’s weight, and customized valving tuned for application and skill level is required for a proper setup on the KX450F. Correct spring rates and Race Tech Gold Valves will increase bottoming resistance and plushness over braking bumps, as well as square edged chop. We guarantee it! The main advantage of Race Tech Hi-Performance Springs is that they have a high stiffness-to-mass ratio. In other words; our springs are light weight for their particular spring rate. This requires the finest materials and processing. We hold the highest tolerances in the industry. These are the best springs you can buy! Find your recommended spring rate. For added performance out of your KX450R's shock, we recommend installing Race Tech’s G3-LD Shock Gold Valve Kit. This Gold Valve Kit allows the shock to absorb the toughest of landings and smooth out the biggest of breaking bumps while remaining plush and providing traction over small chatter. Race Tech offers a Rebound Separator Valve for further increases in rear-end traction and better bottoming resistance. 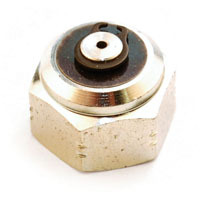 This valve replaces the Shock Shaft Nut with an asymmetric valve that flows through the Low-Speed Rebound Adjuster. This means Low-Speed Rebound Damping can be set for excellent traction while keeping the compression nice and firm. The Yamaha YZ125 has been relatively unchanged for almost a decade now. The tried and true 2014 YZ125 comes with KYB Speed Sensitive System forks that feel relatively soft for the average rider. Since this bike was meant as a stepping stone for younger riders to make from a mini bike to a big bike, the suspension caters to smaller riders. The correct spring rate, specified for the rider’s weight, and customized valving tuned for application and skill level is required for a proper setup on the YZ125. Correct spring rates and Race Tech Gold Valves will increase bottoming resistance and plushness over braking bumps, as well as square edged chop. We guarantee it! Yamaha's YZ125 have a soft front end for the average rider, so we suggest Race Tech Hi-Performance Springs. The main advantage of Hi-Performance Springs is that they have a high stiffness-to-mass ratio. In other words; our springs are light weight for their particular spring rate. This requires the finest materials and processing. We hold the highest tolerances in the industry. These are the best springs you can buy! Find your recommended spring rate. Race Tech’s G3-LD Shock Gold Valve Kit allows your YZ125 to absorb the toughest of landings and smooth out the biggest of breaking bumps while remaining plush and providing traction over small chatter. For almost a decade, the YZ250 has remained relatively unchanged. The trusty 2014 YZ250 comes with a bit of a taller feel in the rear of the bike and soft KYB 48mm forks. The correct spring rate, specified for the rider’s weight, and customized valving tuned for application and skill level is required for a proper setup on the YZ250. Correct spring rates and Race Tech Gold Valves will increase bottoming resistance and plushness over braking bumps, as well as square edged chop. We guarantee it! The Yamaha YZ250 has a soft front end for the average rider, so we suggest Race Tech Hi-Performance Springs. The main advantage of Hi-Performance Springs is that they have a high stiffness-to-mass ratio. In other words; our springs are light weight for their particular spring rate. This requires the finest materials and processing. We hold the highest tolerances in the industry. These are the best springs you can buy! Find your recommended spring rate. To improve great traction, provide a plush feel, and drastically improve bottoming resistance, we recommend a Race Tech Gold Valve Fork Kit. Each Gold Valve kit includes a personalized setup tailored to the individual rider 100% guaranteed to improve comfort, control, and handling. Race Tech also offers Fork Rebound Gold Valve Fork Kits for further tuneability and improved control and traction. This valve kit increases flow area, putting valving control on the shim stack instead of the piston. For additional performance out of your YZ250's shock, we recommend installing Race Tech’s G3-LD Shock Gold Valve Kit. This Gold Valve Kit allows the shock to absorb the toughest of landings and smooth out the biggest of breaking bumps while remaining plush and providing traction over small chatter. Although Yamaha made radical changes to the 2014 YZ250F, the one thing they kept the same from previous models are the KYB suspension components. Most test riders liked the initial plushness, but felt that the bike could use more bottoming resistance. The correct spring rate, specified for the rider’s weight, and customized valving tuned for application and skill level is required for a proper setup on the YZ250F. Correct spring rates and Race Tech Gold Valves will increase bottoming resistance and plushness over braking bumps, as well as square edged chop. We guarantee it! Yamaha's YZ250F has a soft front end feel for average rider, so we suggest Hi-Performance Springs. The main advantage of Hi-Performance Springs is that they have a high stiffness-to-mass ratio. In other words; our springs are light weight for their particular spring rate. This requires the finest materials and processing. We hold the highest tolerances in the industry. These are the best springs you can buy! Find your recommended spring rate. Race Tech’s G3-LD Shock Gold Valve Kit allows your YZ250F to absorb the toughest of landings and smooth out the biggest of breaking bumps while remaining plush and providing traction over small chatter. For 2014, Yamaha made a few key changes to the 2014 YZ450F. A new chassis and tank design allow riders to get more forward on the bike and get more weight on the front wheel. KYB installed stiffer front springs in their forks to help combat the new chassis. By doing that, the average test rider complained of the forks being too stiff and the rear end being too tall and slightly pitched forward. Correct spring rates and Race Tech Gold Valves will increase bottoming resistance and plushness over braking bumps, as well as square edged chop. We guarantee it! The Yamaha YZ450F has a relatively stiff front end for the average rider, so we suggest Hi-Performance Springs. The main advantage of Hi-Performance Springs is that they have a high stiffness-to-mass ratio. In other words; our springs are light weight for their particular spring rate. This requires the finest materials and processing. We hold the highest tolerances in the industry. These are the best springs you can buy! Find your recommended spring rate. For additional performance out of your YZ450F's shock, we recommend installing Race Tech’s G3-LD Shock Gold Valve Kit. This Gold Valve Kit allows the shock to absorb the toughest of landings and smooth out the biggest of breaking bumps while remaining plush and providing traction over small chatter. . The 2014 KTM 125 SX and 150 SX came with relatively few changes over the 2013 model and WP's suspension remained unchanged. Most test riders state the the front is a bit too soft and harsh in the mid stroke of the forks . The correct spring rate, specified for the rider’s weight, and customized valving tuned for application and skill level is required for a proper setup on the KTM 125 SX and 150 SX. Correct spring rates and Race Tech Gold Valves will increase bottoming resistance and plushness over braking bumps, as well as square edged chop. We guarantee it! KTM's 125 SX and 150 SX have a soft front end for the average rider, so we suggest Hi-Performance Springs. The main advantage of Hi-Performance Springs is that they have a high stiffness-to-mass ratio. In other words; our springs are light weight for their particular spring rate. This requires the finest materials and processing. We hold the highest tolerances in the industry. These are the best springs you can buy! Find your recommended spring rate. Race Tech’s G3-LD Shock Gold Valve Kit allows your 125/150SX to absorb the toughest of landings and smooth out the biggest of breaking bumps while remaining plush and providing traction over small chatter. The 2014 KTM 250 SX came with relatively few changes over the 2013 model. Even with KTM's changes, most test riders complained of a stiff feeling on small chop and too soft of a feel on the breaking bumps and bigger hits. The correct spring rate, specified for the rider’s weight, and customized valving tuned for application and skill level is required for a proper setup on the KTM 250 SX. Correct spring rates and Race Tech Gold Valves will increase bottoming resistance and plushness over braking bumps, as well as square edged chop. We guarantee it! KTM's 250 SX has a soft front end for the average rider, so we suggest Race Tech Hi-Performance Springs. The main advantage of Hi-Performance Springs is that they have a high stiffness-to-mass ratio. In other words; our springs are light weight for their particular spring rate. This requires the finest materials and processing. We hold the highest tolerances in the industry. These are the best springs you can buy! Find your recommended spring rate. For additional performance out of your 250SX's shock, we recommend installing Race Tech’s G3-LD Shock Gold Valve Kit. This Gold Valve Kit allows the shock to absorb the toughest of landings and smooth out the biggest of breaking bumps while remaining plush and providing traction over small chatter. The 2014 KTM 250 SX-F came with relatively few changes over the 2013 model. WP made changes to valving in the forks, making the stock suspension better than previous models. Even with KTM's changes, most test riders complained of a stiff feeling on small chop and too soft of a feel on the breaking bumps and bigger hits. The correct spring rate, specified for the rider’s weight, and customized valving tuned for application and skill level is required for a proper setup on the KTM 250 SX-F. Correct spring rates and Race Tech Gold Valves will increase bottoming resistance and plushness over braking bumps, as well as square edged chop. We guarantee it! KTM's 250 SX-F has a very stiff front end for the average rider, so we suggest Hi-Performance Springs. The main advantage of Hi-Performance Springs is that they have a high stiffness-to-mass ratio. In other words; our springs are light weight for their particular spring rate. This requires the finest materials and processing. We hold the highest tolerances in the industry. These are the best springs you can buy! Find your recommended spring rate. Race Tech’s G3-LD Shock Gold Valve Kit allows your 250SX-F to absorb the toughest of landings and smooth out the biggest of breaking bumps while remaining plush and providing traction over small chatter. The 2014 KTM 350 SX-F came with a few changes over the 2013 model. WP made changes to valving in the forks, making the stock suspension better than previous models. Even with KTM's changes, most test riders complained of a stiff feeling on small chop and too soft of a feel on the breaking bumps and bigger hits. The correct spring rate, specified for the rider’s weight, and customized valving tuned for application and skill level is required for a proper setup on the KTM 350 SX-F. Correct spring rates and Race Tech Gold Valves will increase bottoming resistance and plushness over braking bumps, as well as square edged chop. We guarantee it! KTM's 350 SX-F has a very stiff front end for the average rider, so we suggest Race Tech Hi-Performance Springs. The main advantage of Hi-Performance Springs is that they have a high stiffness-to-mass ratio. In other words; our springs are light weight for their particular spring rate. This requires the finest materials and processing. We hold the highest tolerances in the industry. These are the best springs you can buy! Find your recommended spring rate. For additional performance out of your 350SX-F's shock, we recommend installing Race Tech’s G3-LD Shock Gold Valve Kit. This Gold Valve Kit allows the shock to absorb the toughest of landings and smooth out the biggest of breaking bumps while remaining plush and providing traction over small chatter. The 2014 KTM 450 SX-F remained relatively unchanged from the 2013 model. In the suspension department, most test riders complained of a harshness in the bottom of WP's forks, which can be tailored with a proper spring rate. Test riders have commended that the Race Tech Progressive Rate Shock Springs and Race Tech Gold Valves will increase bottoming resistance and plushness over braking bumps, as well as square edged chop. We guarantee it! KTM's 450 SX-F is known for having a harshness in the bottom of the fork's stroke, so we suggest Race Tech Hi-Performance Springs. The main advantage of Hi-Performance Springs is that they have a high stiffness-to-mass ratio. In other words; our springs are light weight for their particular spring rate. This requires the finest materials and processing. We hold the highest tolerances in the industry. These are the best springs you can buy! Find your recommended spring rate. Race Tech’s G3-LD Shock Gold Valve Kit allows your 450 SX-F to absorb the toughest of landings and smooth out the biggest of breaking bumps while remaining plush and providing traction over small chatter. Suzuki's 2014 RM-Z250 remained unchanged over the 2013 model. Most test riders of the 2014 RM-Z250 complain of a very stiff front end and softer shock setting than normal, making for a very unpredictable ride. The good news for consumers is that Race Tech Gold Valves will give owners an advantage, providing riders with a plush feel and that extra traction that the stock suspension lacks, while not compromising bottoming resistance. The correct spring rate, specified for the rider’s weight, and customized valving tuned for application and skill level is required for a proper setup on the RM-Z250. Correct spring rates and Race Tech Gold Valves will increase bottoming resistance and plushness over braking bumps, as well as square edged chop. We guarantee it! Suzuki's RM-Z250 has a very stiff front end for the average rider, so we suggest Hi-Performance Springs. The main advantage of Hi-Performance Springs is that they have a high stiffness-to-mass ratio. In other words; our springs are light weight for their particular spring rate. This requires the finest materials and processing. We hold the highest tolerances in the industry. These are the best springs you can buy! Find your recommended spring rate. For additional performance out of your RM-Z250's shock, we recommend installing Race Tech’s G3-LD Shock Gold Valve Kit. This Gold Valve Kit allows the shock to absorb the toughest of landings and smooth out the biggest of breaking bumps while remaining plush and providing traction over small chatter. Suzuki's 2014 RM-Z450 remained unchanged over the 2013 model. Most test riders of the 2014 RM-Z450 complain of a very stiff front end that would deflect off of breaking bumps rather than absorbing them, making for a very unpredictable and twitchy front end. The good news for consumers is that Race Tech Gold Valves will give RMZ450 owners an advantage, providing riders with a plush feel and that extra traction that the stock suspension lacks, while not compromising bottoming resistance. The correct spring rate, specified for the rider’s weight, and customized valving tuned for application and skill level is required for a proper setup on the RM-Z450. Correct spring rates and Race Tech Gold Valves will increase bottoming resistance and plushness over braking bumps, as well as square edged chop. We guarantee it! The main advantage of Hi-Performance Springs is that they have a high stiffness-to-mass ratio. In other words; our springs are light weight for their particular spring rate. This requires the finest materials and processing. We hold the highest tolerances in the industry. These are the best springs you can buy! Find your recommended spring rate. Race Tech’s G3-LD Shock Gold Valve Kit allows your RM-Z450 to absorb the toughest of landings and smooth out the biggest of breaking bumps while remaining plush and providing traction over small chatter. The 2014 Husqvarna TC125 is a brand new bike compared to the 2013 model. Most test riders state the the front is a bit too soft and harsh in the mid stroke of the forks . The correct spring rate, specified for the rider’s weight, and customized valving tuned for application and skill level is required for a proper setup on the TC125. Correct spring rates and Race Tech Gold Valves will increase bottoming resistance and plushness over braking bumps, as well as square edged chop. We guarantee it! For additional performance out of your TC125's shock, we recommend installing Race Tech’s G3-LD Shock Gold Valve Kit. This Gold Valve Kit allows the shock to absorb the toughest of landings and smooth out the biggest of breaking bumps while remaining plush and providing traction over small chatter. The Husqvarna TC250 is an all new, redesigned bike for 2014. Even with Husky's changes, most test riders complained of a stiff feeling on small chop and too soft of a feel on the breaking bumps and bigger hits. The correct spring rate, specified for the rider’s weight, and customized valving tuned for application and skill level is required for a proper setup on the TC250. Correct spring rates and Race Tech Gold Valves will increase bottoming resistance and plushness over braking bumps, as well as square edged chop. We guarantee it! Race Tech’s G3-LD Shock Gold Valve Kit allows your TC250 to absorb the toughest of landings and smooth out the biggest of breaking bumps while remaining plush and providing traction over small chatter. The 2014 Husqvarna FC250 is a brand new bike from the ground up. WP made changes to valving in the forks, making the stock suspension better than previous models. Even with Husky's changes, most test riders complained of a stiff feeling on small chop and too soft of a feel on the breaking bumps and bigger hits. The correct spring rate, specified for the rider’s weight, and customized valving tuned for application and skill level is required for a proper setup on the FC250. Correct spring rates and Race Tech Gold Valves will increase bottoming resistance and plushness over braking bumps, as well as square edged chop. We guarantee it! For additional performance out of your FC250's shock, we recommend installing Race Tech’s G3-LD Shock Gold Valve Kit. This Gold Valve Kit allows the shock to absorb the toughest of landings and smooth out the biggest of breaking bumps while remaining plush and providing traction over small chatter. The 2014 Husqvarna FC450 is a brand new bike compared to the 2013 model. In the suspension department, most test riders complained of a harshness in the bottom of WP's forks, which can be tailored with a proper spring rate. Test riders have commended that the Race Tech Progressive Rate Shock Springs and Race Tech Gold Valves will increase bottoming resistance and plushness over braking bumps, as well as square edged chop. We guarantee it! Race Tech’s G3-LD Shock Gold Valve Kit allows your FC450 to absorb the toughest of landings and smooth out the biggest of breaking bumps while remaining plush and providing traction over small chatter. Check out the link to learn about Moto-Cross History in the USA! Legends and Heroes is a rolling Moto-Cross Museum outlining the history of MX in the US. Featuring displays of Championship winning Motorcycles, Riders, and Memorabilia along with multimedia presentations of classic races and interviews this display is not to me missed! 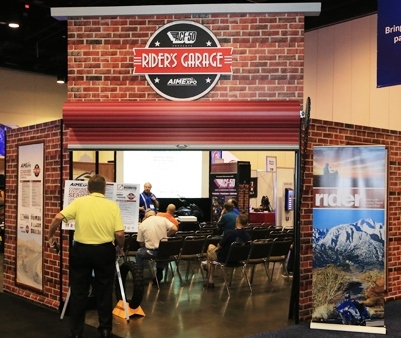 The tour can be found at AMA Super-Cross, Outdoor and AHRMA National Events. 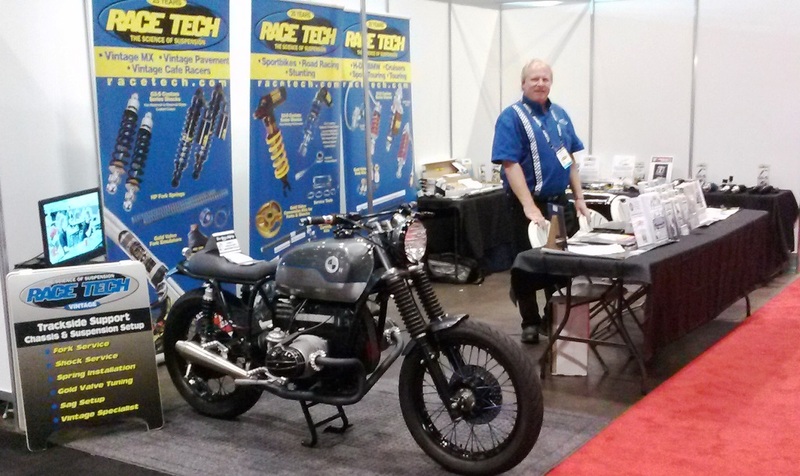 Race Tech is pleased to be exhibiting again at the 5th annual American International Motorcycle Expo 2017. 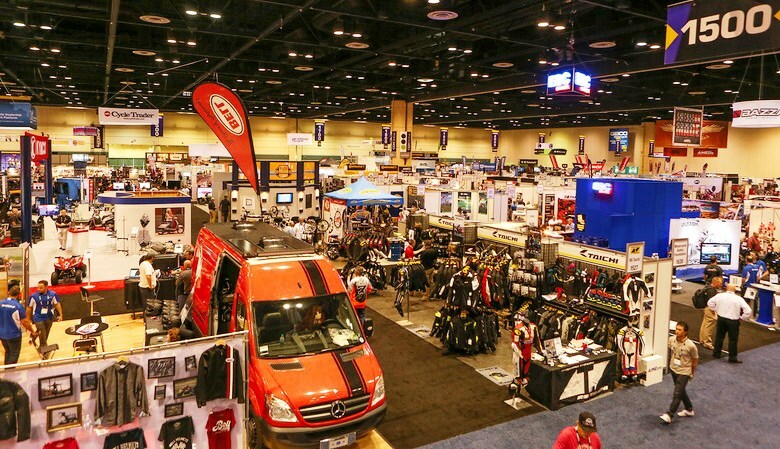 The Expo has doubled in size each year and is set to become the premier US Motorcycle Show. If you need to lower your suspension for a racing application or just to fit the bike better, you've come to the right place. Race Tech has been lowering motorcycle suspensions for years and can accommodate most requests. If you have a Motorcycle not listed in our applications we would very much like to develop it!